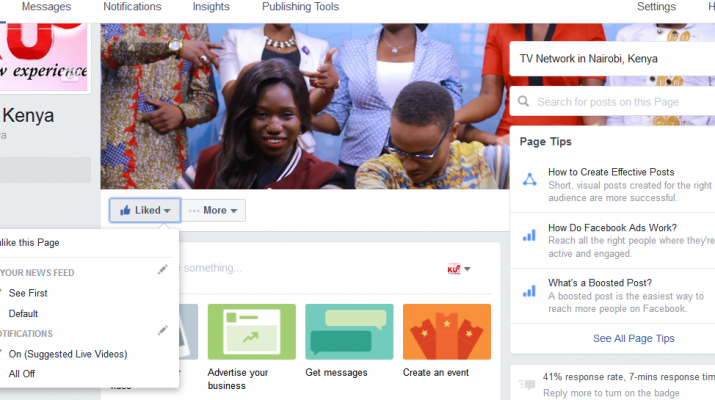 How to see post from pages you like first on your Facebook timeline – Kenyatta University TV (KUTV). All Rights Reserved. Sometimes you meet those entertaining pages of posts on Facebook but finding the exact or account is not easy. Bookmarking the page is one of the best ideas, but on Facebook, you only need to set it to ‘see first’. To effect this, you need to log into you facebook account. Secondly, search for your favorite page and like it. After liking the page, click on the downwards arrow at the ‘LIKED” button and select see first. Boom! You are set to go. Whenever a new post is uploaded on the Facebook page of your choice, the posts from that page will come first when you refresh your Facebook timeline. Do not miss the fun, bookmark the page and keep tracking our updates.